Our South Australian racing guru Adam Mintz is the subject of this edition of Punting Pointers. We take a look back at Adam’s appearance on the Betting 360 podcast, and summarise his key messages. I do weight ratings, so it’s pretty much based on the Don Scott method. That’s what I’ve always done, but I use a database and have an intimate knowledge of all the horses running around. I do all my own videos of all SA races. I actually don’t walk tracks anymore. I have rail positions and track ratings going back years and years, a long time, so I find that I can actually be as accurate by going back and analysing that data than I can by walking the tracks. It’s just one of a number of variables I use. I think probably the biggest things are your class ratings and analysing the class of the race that they’ve run in, and your video comments. I’d say they would be two of the bigger things. I slowly grew my bank. I pretty much finished university and I couldn’t get a job so I was doing this, and I got engaged soon after that so whatever money I did have I put towards a house. After that, I was trying to get a job and couldn’t. My wife said to me, “Why don’t you have another crack at it?” Pretty much with very limited funds. I think most corporates are using the same video comments which come from the one central place, which is Best Bets. I think when you do your own and you’re a punter, I think you probably take a little more effort and you’re a little bit more precise with it and you don’t miss things. I think when your own cash is involved and you’re a punter, I think you’re a little bit more careful. That’s with regard to tipsters as well. I’m not really interested in anyone’s opinion unless they have a bet. I just think you’re a lot more precise and concise and exact when your own money’s involved. First thing I do would be a speed map, positions in running and then I’d decide if there’s good speed, some speed, minimal speed and take it from there. Then using past performances and today’s conditions, I’ll come up with a weighted ranking and that takes into account all sorts of different things: jockeys, barriers, everything. That’s then transferred into a market around 90%. Each horse will have have its own final rating, and that’s just a mathematical equation that turns that into a percentage and hence, odds. I think now provincials are probably better value for me. I think everything seems to be more exposed in the city. 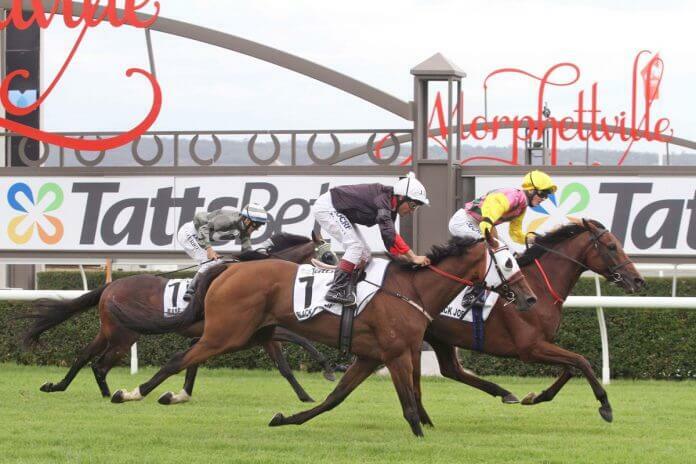 I think the trouble we have here in Adelaide is I think we have Morphettville and Morphettville Parks, I think Morphettville Parks is not a great track to bet on. I think there are a lot of hard luck stories. I probably don’t bet as much at Morphettville on the Parks track. Overall I think probably the provincials are a little bit more value for me nowadays. I think you have to be flexible. Track bias is a huge one. You have to be flexible enough to be able to change that. You also need to be able to, with some runners, first start for a new trainer or whatever, you can’t be confident of your rating. You have to take into account what the market’s doing. Yeah, I do change things around depending on certain circumstances throughout that half hour before the race. It depends on how exposed the form is. How confident I am how the race is going to be run, all that sort of thing will determine how much I bet, my staking plan. It’s not too involved; it’s pretty easy to follow. I pretty much have two levels. I used to have three, but I pretty much have two levels now with regard to confidence. Pretty much with my markets, a lot of the time you’re not on your favourite. Your favourite seems to be unders. Definitely my better results are the middle pinners. It’s all pretty structured what I do, it’s set so it just seems to be the fact that a lot of the time I’m just not on my favourite. Usually if you’ve got one of the, what I judge to be one of the better jockeys here, when you come up with your final figure it’s taking into account that jockey should give it every chance. There’s probably six jockeys here that I would say they’re all around the same mark, not much between them. I think there are huge opportunities for apprentices in Adelaide. I’m on claiming apprentices a lot when I’m betting, I think a lot of them are worth their claim. Jockey’s skill factor is a huge thing. I don’t think the consistency in performance in Adelaide is probably as good as maybe it is elsewhere. But there are a number of trainers that we have here that their runners produce very consistent figures. But that does come into it, the trainer of the runner. Also the smaller trainers, I’m quite happy to back the horses first up or early in their prep with a trainer who only has a few runners but I think the effort and the sort of time that goes into each of those runners when they’ve only got a few in their stable, I think that usually pans out that they run pretty well early, or fresh in their campaign. It’s a lot harder now. There’s still opportunity there, but you have just got to get better and better at it and make less mistakes. I still find myself jotting down little notes that help me, and then I realise that you’re always sort of learning and getting better at it. It’s very easy in this game, you can be on top of the world and think you know it all, and then you can have a few bad runs and you’re doubting yourself. If you stick to your principles and what’s sort of been successful for you, that’s worked for me over the years. As punters we all have bad runs. When you start to second guess what you’ve done and you’re rehashing your market all the time, I think it’s probably a good indication that maybe you’re not on top of your game. I think opinion’s a big thing. Being a good judge is a really important thing, and data and your program and everything can only do so much. You’ve got to have an opinion. I think you’ve got to have that ability to read a race and to be able to come up with something that gives you a slight edge. Click here for Adam’s interview on the podcast and a full transcript of the conversation, or check out his hugely successful SA Ratings package, which made over 100 units profit at 20%+ PoT in 2016.